Ocha’ni Lele, renowned author of many Lucumí books including Diloggún Tales of the Natural World, The Secrets of Afro-Cuban Divination and Sacrificial Ceremonies of Santería, is now offering his Basic Diloggún Divination Class available to Olorishas online. 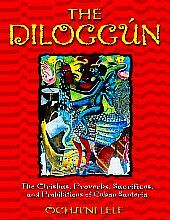 This course is one of the best courses available online to learn the basics of diloggún divination including the process of determining odu, its orientation (ire/osogbo), marking ebó and the meanings of the 16 main odu. The course takes place over the span of 33 weeks and costs $400 ($200 deposit). While Ocha’ni Lele is not a member of our ilé we HIGHLY recommend his classes as they are some of the best out there, and his books are some of the best written on the Lucumí faith. To learn more and sign up for Ocha’ni Lele’s Basic Diloggún Divination Class, visit his site at the following link. 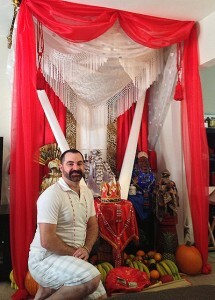 As part of this celebration, we set up a traditional throne made of draped fabrics to commemorate the throne Rev. Dr. E. lived under for the seven days of his initiation. All of the orishas he received at his ordination were placed under the throne’s canopy and decorated with paños (altar cloths) and mazos (beaded shrine decorations). A plaza of fruits are placed under the throne as offerings, and are then distributed to any visitors who came to pay their respects to Changó on his birthday. A priest’s ocha birthday is a time for the godfamily to come together and honor the priest’s anniversary as well as pay respect to the orishas with food, fellowship and fun. Listen to Rev. Dr. E. on Candelo’s Corner, KDCL Media! Listen to our founder Rev. Dr. E. on the blogtalk podcast Candelo’s Corner on KDCL Media! Listen live or listen to the recorded episode at the following link! Rev. 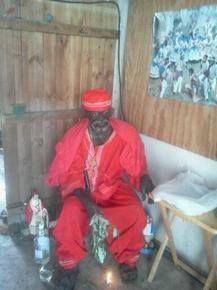 Dr. E. will be discussing SAFE (Santeros Against Fraud and Education) and the Santeria Church of the Orishas! Listen to Rev. Dr. E. on Candelo’s Corner!